We are building an AngularJS application that will talk to a backend API written with Django Rest Framework (DRF for short). Let's see how we do that nicely and securely. Running an application on the Internet requires to authenticate clients and servers which each other. If your phone number is listed in the yellow pages, anyone can call you. So both, client and server must be mutually distrustful until they can verify each other's identity. How to show a different interfaces based on a user permissions? How to authenticate the AngularJS application with the API? How to pass the API end-points to the AngularJS code? Since anyone can call our API end-points (i.e. they know our number), we must implement the permission checks server-side. None-the-less it would be a very poor interface to show buttons and links to a user that will always result in 403 - Permission denied. As a side note: Why your user interface is awkward. You are ignoring the UI stack is a great read on the subject. The customization of the interface can be done in two different ways. If we have an AngularJS-light application, we generate different HTML server-side through the Django template engine. If we have an AngularJS-heavy application, we pass the user permissions through the *settings* parameter and customize the interface client-side. Not all our API calls will be GET requests. We also want to modify state on the server at some point. Django will check the CSRF token in those cases. We thus need to communicate the CSRF token to AngularJS and tell AngularJS to pass it back to the server on POST/PUT/PATCH requests. With scaffolding and session authentication in place, we can present a user-tailored interface and our AngularJS application can now reliably talk to the server. It is time to restrict what can be done server-side based on the request.user. 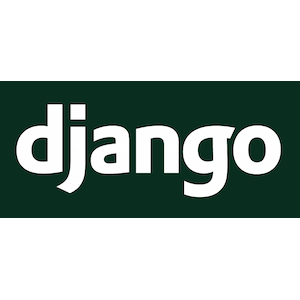 Here we have to understand a bit of how the Django and Django Restframework pipelines work. or as code inside the View method implementation. DRF extends the request pipeline with 4 steps that usually happen before your overridden view method is called (see View.dispatch in rest_framrwork/views.py). We will thus rely on the django-urldecorators project and add our permissions checks as decorators in the top-level urls.py file. This works with both Django Views and DRF Views. Et Voila! 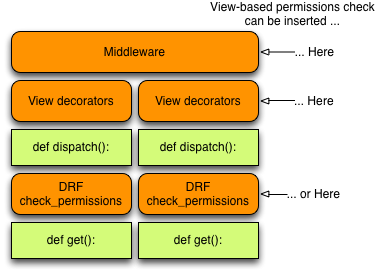 To understand which kind of permissions decorators are necessary to run a Software-as-a-Service business, please read about djaodjin-saas flexible security framework.